Bay leaf is known as a culinary spice, which enriches meals with its distinctive aroma and pleasant taste. Bay leaf wood is much more than that and it brings many other benefits that will convince you in this article, in which we will among other things give the recipe for the bay leaf syrup, and tea. Laurel is an evergreen tree with green, glossy, leathery leaves, penetrating aroma, strong and bitter taste. In phytotherapy it is most commonly used as a remedy for many ailments, about which will be discussed sometimes later. The yield is egg-shaped, quite similar to olives. It blooms in April and May. Laurel tree grows as a wild plant and thrives around the Mediterranean, and rarely is found in the continental areas. It is often grown in gardens and cultivated bay leaves can be from the seed or from the other laurel tree. Those with patience, can make of it a beautiful garden decorations, in a way that while it is a small tree, fasten and screw the small stems of laurel in a spiral, which will later connect as the tree grows and undoubtedly you will get an interesting decoration for your garden. Laurel tree requires well-drained soil, and to thrive in fine gardens it favours sunny spots with partial shade during the day. Make an effort to provide solid protection from the wind, especially those stronger ones, because the rules of planting laurel are that it is not recommended to be on a fully open space. Bay leaf and the entire tree must be cultivated in the summer and you need to take extra care of it because forests pests can be quite a problem. It is necessary to check and try to remove all damaged parts of the tree. Today laurel seedlings can be purchased as shrubs, or a pyramid in its standard shape. It looks nice when planted along the low hedges or in the beds, it can grow well and is a real adornment for eyes. You can plant it in a pot in which gravel is added, and on cold days bring it inside the house, especially during winter. Half-ripe fruits are planted during summer (cut the bay leaf in half to prevent greater losses of water) or you can do it with bark, just remove the branches that can be planted again. Seeds of laurel are planted in fall, remove the part that is fleshy and keep it capped in an appropriate cold container. As we said in the introduction, the bay leaf from ancient times has been used as a spice and as a medicine, mainly because of its antiseptic and anti-inflammatory properties. It is rich in the B group vitamins (riboflavin, pyridoxine, niacin and pantonic acid) that help better functioning of nerves and muscles system, positively influences the metabolism, hormonal status and bay leaf contains many minerals: potassium, copper, manganese, calcium, selenium, iron, magnesium and zinc. Bay leaf tea is used in the treatment of diseases of the digestive system, anorexia, loss of appetite, diabetes, cardiovascular disorders. It is also used to disinfect places containing influenza viruses, colds and various other microbes. It is also used as a sedative in case of nervousness, tension and insomnia, but if you overdo it with the amount it can cause hallucinations. 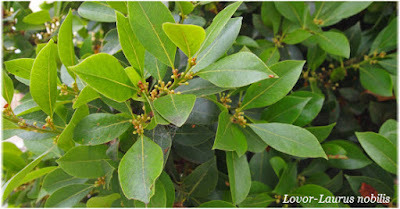 Also, bay leaf can be of a great help in the treatment of gout and rheumatism, and the essential oil is used successfully in the treatment of diseases of the lymph nodes because it raises the immunity, and if only a few drops are rubbed on the area of ​​the lymph nodes you alleviate the symptoms. Bay leaf-oil is used for inhalation in case of problems with the respiratory tract, it reduces unpleasant frequent cough and encourages us to cough up the mucus from the lungs. In the phytotherapy leaves are picked when they are already fully developed, not the young ones. In cosmetics bay leaf as an anti-dandruff showed excellent results and is an integral part of many creams and lotions for oily skin and hair in the form of shampoo. Finely chop three bay leaves, pour over 2.5 dl of water and cook for about ten minutes. Remove from the heat and keep the lid on for another ten minutes, then you need to drain it. In the filtered tea, add a tablespoon of lemon juice and two tablespoons of local honey. The beverage is drunk two to three times daily in an amount up to 3 dl. Thus prepared bay leaf tea for cough is recommended for strengthening the immune system influenced with the flu, and is most effective with bronchitis and respiratory problems. One old folk recipe also goes like this: Put in a bowl half a litre of water and 150 grams of sugar, let it boil and add ten sheets of bay leaves and cook for another 30 minutes. After that it needs to be removed from the container and pour the mixture into a suitable cup or jar. Use it freely if necessary! Here is another laurel syrup against cough, which will surprise you with its pleasant and mild taste, which is often not the case with other recipes for this purpose. It can be drunk easily with relish, and the main merit belongs to the bay leaf which is at the same time sweet and bitter, while the lemon is bitter. In a bowl cook water, so when it boils insert bay leaves, cover and cook for 6-10 minutes. Take bay leaves one by and pour the liquid into another bowl. In it, add brown sugar and squeeze one lemon. Laurel syrup needs to be stirred and then you need to wait for the sugar to melt. 2-3 teaspoons a day are quite an adequate dose, which will be enough to alleviate discomforts. Keep the laurel syrup in refrigerator and as such it can be used longer than 3 days, after that it is desirable to make a new batch. In case of severe cold, you can add additional slice of lemon and chew. This will alleviate unpleasant and dry cough. The bay leaf has a multipurpose and is very useful for the treatment of the whole range of health problems. The next couple of recipes will convince you that this is true. In the evening, take a tablespoon of bay leaf (finely ground), pour 3 dl of water over it and boil in an enamel pot up to 5 minutes. Pour everything in a thermos and let it spend the night. In the morning, drain the fluid from a thermos into another container and use the drink every day. Drink in small sips, do not drink the whole amount at once. After seven days, repeat the treatment. If you experience frequent urination, do not be worried, because it should be like that. It is a good sign that the bay leaf has begun to dissolve salt, which can irritate the bladder a little. The real results of this treatment, will be visible only after ten or more days when you feel a lot easier, and pain in the joints will completely disappear. Finely chop 5 large bay leaves, and pour with 96% alcohol (100 ml). Leave for seven days to rest, then you need to strain it. Rub it on the bunions but only after steaming your feet in 3 litres of warm water with a tablespoon of baking soda. Wipe your feet, apply the mixture, put on short cotton socks and go to bed. HOW TO MAKE A BAY LEAF TINCTURE. Finely cut fresh bay leaves (30 g) and put in a glass dish and cover with 3 dl of homemade brandy (strong or more than 60%). Close the bottle well and keep for ten days in a warm place, after which it should be filtered. Bay leaf tincture is great for the treatment of sprains, Achilles tendon inflammation, sprained joints, excessive muscle tension, and rheumatism and is effective with complete paralysis of limbs.